Aboriginal dancers, originally uploaded by NeilsPhotography. Hello everyone, my name is Ashley Jones. I picked this picture of Aboriginal dancers for a couple of reasons. I am currently residing in Australia and the beliefs and traditions of the Indigenous People facinate me. Oral communication is greatly valued within Aboriginal communities and serves as a method of passing down specific cultural practices, values, beliefs, languages, laws, histories and family connections. These can be communicated through storytelling, song, dance and art. 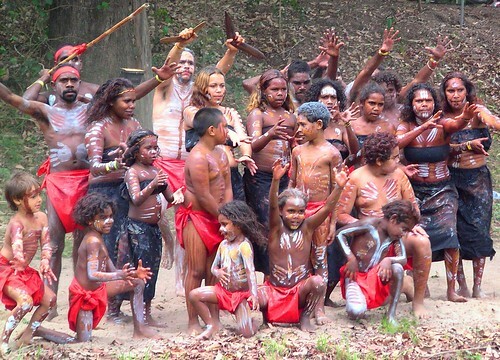 It is believed that there were over 700 distinct language groups in Australia prior to the European Invasion. As for myself, I completed a Biology degree and then went on to complete a year-long internship to obtain my teachers certificate. Soon after I took off to teach for a year in a small town in Costa Rica where I developed a passion for surfing and cooking with hot chilli peppers! Upon returning to Canada, I taught at a Secondary Distributive Learning School in Victoria, BC for three years. The courses I taught and developed were all online for the students to access, while I was avaliable at the school for drop-in help, tutorials and to supervise test writing. This year, my husband took a year-long job in Australia so I am fortunate to be able to complete my Masters while in beautiful Perth! I look forward to getting to know you all as we go through this course! 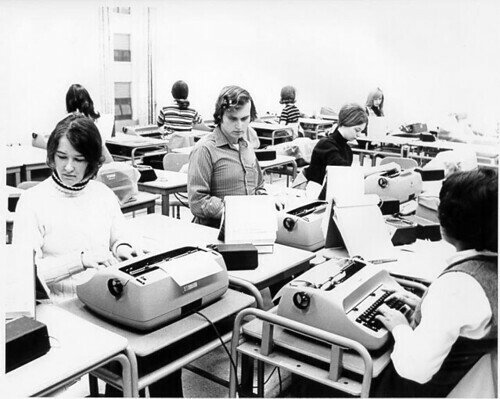 Typing Class, 1970s, originally uploaded by SinclairCommunityCollege. Update the hair and clothing by a decade, and this would look like my high school typing class. Take away the power cords and regress a few decades, and this would look like my mom’s high school typing class. Now, typing classes have been replaced with computer applications courses, which teach touch typing in two to three months (e.g., http://south.sd41.bc.ca/depts/courses/cselection.htm – from the website of my alma mater), as by the time most students enter high school, they have been using a QWERTY keyboard attached to a computer for years, many without a lesson. This allows for a greater exploration of the creative applications of the technology far beyond the endless speed drills I spent doing in Typing 10. What change will the next innovation bring? As a side note, I also considered the furniture and electrical systems that needed to change from the time when the first manual typewriter was introduced in typing classes, through electric typewriters, through a constant upgrade of computers. Education is, indeed, getting more expensive! Hello! I am Tracy Gidinski. I will be teaching grades 6 and 7 at Taylor Park Elementary School in Burnaby, British Columbia. I have been teaching for 16 years, always focusing on grades 5 to 7 (and, for a four-year time, teaching a multiage 5/6/7 class). My preferred grade is combined 6/7. For the past few years, I have had my students create personal blogs and cooperative wikis, and am interested in further extending my students’ abilities to use technology to improve their literacy and thinking skills, which leads me to this course. This is my second MET course – I took ETEC 512 last year, and am hoping that the steep learning curve of taking a course online will be less steep this semester! YES, originally uploaded by jeremyhead. It is said that when John Lennon visited Yoko Ono’s art exhibit, he climbed a ladder to see a single word on a paper attached to the ceiling. 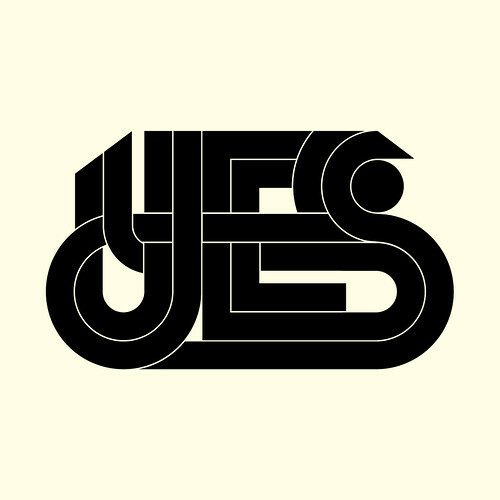 That word was…Yes. He was so impressed with an artist who would have such positive thoughts that he decided to meet Yoko, and then, well the rest is history. All words have magical powers. The power to inspire, the power to intimidate, the power to woo or soothe…And words take on different powers depending on how they are spoken or how they appear in print. And most importantly, it is the knowledge of words that gives us such power over circumstances and surroundings. Empower yourself! Learn a new word today! I am a Business/Computer teacher in Ontario. Literacy is of interest to me in that it is a necessary component of student success. Equally important is that my own son was touched by the power and magic of learning to read. It opened the door to a whole world that would have remained silent to him and allowed him to share his sometimes chaotic, sometimes frightening thoughts.